The only book you need regarding 2010. The Vancouver Sun spun a story on June 5, 2006 to initially make it look like it is a good thing that VANOC will give Ronald McDonald access to public schools in B.C. WOW! This is definitely bad for the community, but if you read the Sun headline and the first few paragraphs, plus saw the smiling pic of Ronald McD, you would never know it. Did you see this coming, or did VANOC sneak another fastball by you? Personally, I never equate junk food with Olympians, but apparently Olympic organizations feel a Big Mac is the breakfast of champions. McDonalds obviously loves the offer because it gives them access to new young customers at a vulnerable time in their lives, access they would never have if it weren't for the Olympics. It's a legacy health conscious Vancouverites can be proud of. 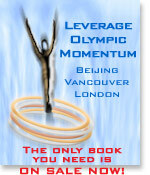 Some Olympic regions go along with this type of sponsorship, and others feel it is too intrusive. Speaking as a responsible parent, it is wrong, but now that it seems to be a done deal I also feel that if McDonalds has access to schools, that other types of companies should also have access to kids in school and also be allowed to market to them the same way McDonalds does. Junk food companies or any product that can be deemed detrimental to children should not be allowed on school property, but I see nothing wrong with giving access to companies like clothing, technology, and sports companies, etc. 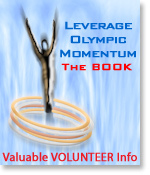 Excerpt from Leverage Olympic Momentum . . .